A delicious, quick and easy skillet meal! Remove casing from Italian sausage and slice into 1/2” pieces. Open the cans of diced tomatoes and tomato sauce. In a large skillet, saute the sausage pieces until no longer pink. Stir in the diced tomatoes, tomato sauce, Italian seasoning and garlic powder and stir together. Season with salt and pepper to taste. Let simmer for 5 minutes. Then add in the hot water and dry pasta into the sauce. Stir and press the pasta completely into the water. Cover with tight fitting lid and simmer over low heat for 10 minutes, or until pasta is cooked through. Remove from heat immediately so pasta doesn’t overcook. Sprinkle grated Parmesan cheese on top as garnish. 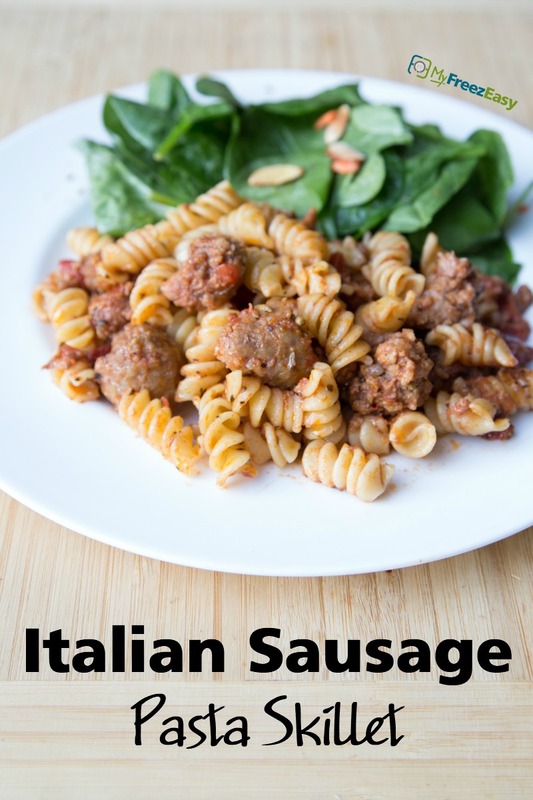 Serve Italian Sausage Pasta Skillet with salad. Open 2 cans of diced tomatoes and 2 cans of tomato sauce. Remove as much air as you can and seal. Freeze up to 6 months in your fridge freezer or 12 months in a deep freezer. Put baggie in the freezer and freeze up to 6 months in fridge freezer or 12 months in a deep freezer. Thaw in the fridge overnight, or a warm bowl of water for about 20 minutes, before transferring to the skillet to reheat and then cook in the pasta with water, as directed. Omit the grated Parmesan cheese garnish for dairy-free meal. 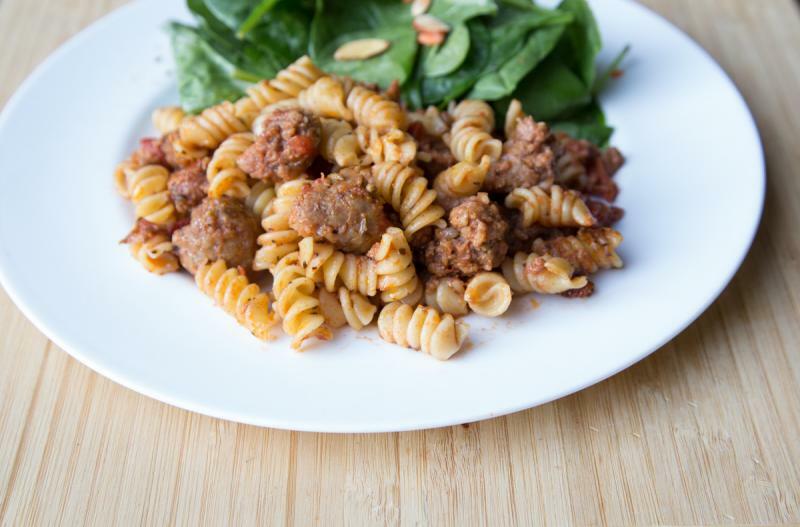 Recipe is gluten-free when made with gluten-free pasta. Thaw and cook sausage with sauce in skillet. Stir in 2 cups hot water with 12 oz. small shell pasta and cook 10 minutes until pasta is tender. Serve with Parmesan cheese garnish and salad.